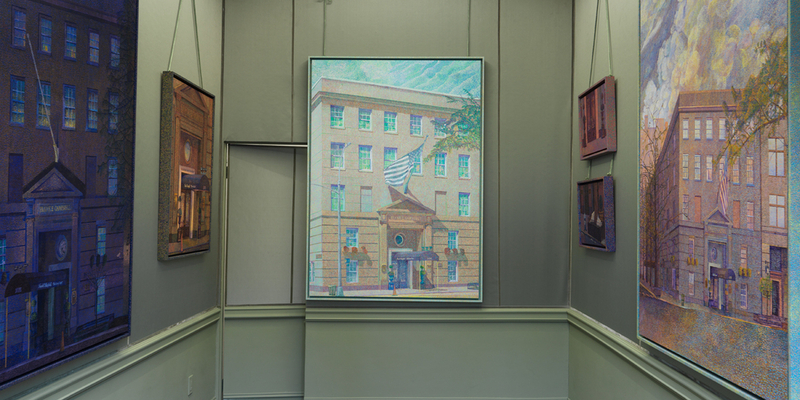 View of “Cynthia Talmadge: 1076 Madison,” 2018–19. Who could ever blame someone for falling in love with death? After a string of immediate family members died, artist Cynthia Talmadge began a series of paintings depicting the Frank E. Campbell Funeral Chapel on Manhattan’s Upper East Side. The parlor became famous in 1926 when its namesake alerted the paparazziand even hired mournersto a public viewing of silent-film star Rudolph Valentino’s body, without the knowledge or consent of Valentino’s family. This turned the chapel into a spectacular mainstay of bereavement, hosting services for all manner of celebrity and notable, including Jacqueline Kennedy Onassis, Judy Garland, Tennessee Williams, and Biggie Smalls. Each of the show’s eight paintings depicts the building in a labor-intensive pointillist style, which spills over onto the work’s frames. A few are straightforward renderings of its facade, while others provide details of the building’s security cameras (View From 81st Street, all works 2018) or its wrought-iron doors (Frank E. Campbell [Gates at Dawn]). Every image is painted to illustrate a different time of day or season, which shifts the emphasis from the building itself to the varying qualities of light among the paintings. One can’t help but think of Monet’s obsession with capturing the Rouen Cathedral, a fixation so deep that he often reported having nightmares of cathedrals crashing down on him in an array of colors. Talmadge brought in a design firm to transform the gallery spacethe walls are covered in a mossy green silk, with accents of gauche crown molding. The paintings hang from ropes à la a nineteenth-century salon. These final notes drizzle the show with an awareness that this series can’t bring her loved ones back from the dead. But it’s certainly worth trying.